← Australian White Spotted Jellyfish…. Blue Jelly (Catostylus mosaicus) is a species of jellyfish in the Rhizostomeae order. 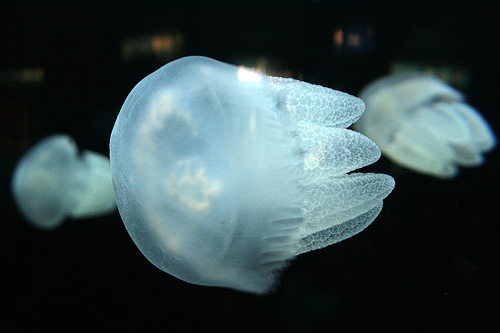 It is characterized by a lack of tentacles at the margin of the jellyfish’s body. Instead, it has about 8 oral arms. These oral arms become fused with the body of the jellyfish near the centre of its body. What is fascinating about the oral arms of the blue blubber is that they have minute mouths at the end of the oral arms that themselves transport food to the stomach! Also, the oral arms of the blue blubber have a certain three-pronged shape that makes them easy to identify. The blue blubber uses its oral arms to capture its food. Its oral arms are lined with numerous nematocysts that contain venomous stings. When blue blubbers come in contact with a prey, they inject their venom into the prey in order to kill or paralyze it. Once the prey is immobilized, the blue blubber eats it with its tiny mouths. The blue blubber uses the same mechanism to defend itself from predatory animals. In the case of humans, the toxins in the venom of blue blubbers does not cause any harm. Very sensitive individuals may develop an itchy rash or have an allergic reaction. This entry was posted in 5% acetic acid/Vinegar on jelly stings, Box jellyfish, florida-jellyfish-portuguese-man-of-war-florida-beaches-long-island-beaches-hawaii-waikki-oahu-guam-austalia-stingersmauve-jellyfis-pelagia-nortiluca-black-sea-nettles-stingrays-sport-fi, jellyfish, jellyfish species, jellyfish sting first aid, Jellyfish sting remedy, jellyfish stings, Jellyfish stings, vinegar, acetic acid, Lion's mane jellyfish, Man of War, marine sting first aids, marine stings, Pacifici coast sea nettles, Pelagia Nortiluca, sea nettles, StingMate, Vinegar on Jellyfish stings. Bookmark the permalink.